The Best Prices in the market in the coolest boat!!! Half of the season in the southern atolls and the other half in the northern atolls. 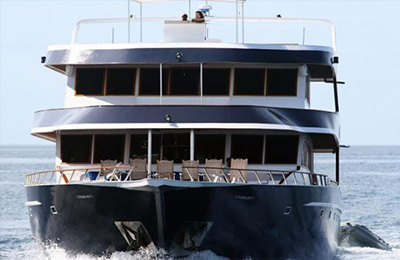 The traditionally built wooden yacht will take you to the secluded beaches with individual or small groups bookings. A smaller diving boat available for secret surf spots where a larger boat just cannot enter and also possible to use it for a diving experience. There are 6 comfortable air-conditioned ensuite rooms with a view of the beautiful scenery around the boat. 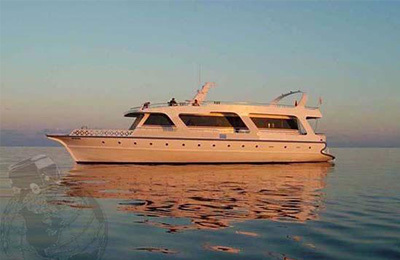 There are 2 Double Bedrooms and 4 Twin Bedrooms on board. If you are an average surfer that is looking for long perfect head high waves, then the Maldives is your dream come true! You will see turtles, dolphins, manta rays, beautiful strange colored fish and whales (during the season). Doubles rooms with private bathroom, 5 meals per day, check the pictures and book your trip as soon as possible. 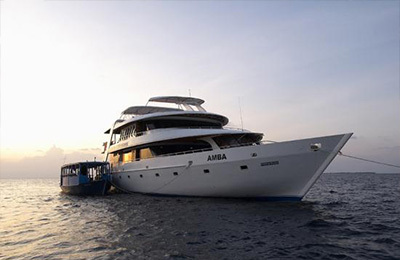 Accepts single bookings, not necessarily full boat charter. The Maldives is divided into 3 parts. The northern Atolls, the center atolls, and the southern atolls. The Northern Atolls is where most famous surf spots are ( Louis, Jails, Chickens, etc). This is also where the capital city and the international airport is. Relax and refresh your mind on the lounge chairs with mattresses on the Sun Deck. When everyone wakes up at around 6:30 we have Tea, coffee, and cookies ready on the table. Then surfing. Toasts, cereals, eggs, cheese, jam, juice, tea, coffee, and our cook’s “local special”. It can be a mixture of tuna, with crushed coconut and onion. Delicious when you make a burrito with their homemade tortillas. Then relax or surf. Essentially three-course: Western dishes with Maldivian specialties and nationality favorites. Very yummy! Lots of fresh fish! Rice, chicken, pasta, beef, salads, homemade pizzas and bread! Curries and vegetables! Ending with dessert, fruit, and coffee or tea. Good range of chilled soft drinks including fresh fruit juices, and a range of alcoholic beverages including lots of cold beer for sale on board!!! 3 Liters of mineral water per day per person included in the package. In between lunch and dinner, there is another session of cookies, tea, and coffee so it ‘s impossible to be hungry on this boat!!! In general, the Maldives rely on the same swell as Indonesia with the best and most consistent swells coming from April to October. Swell size will likely peak from June to September when south swells from the southern Indian Ocean make their presence known on most of the exposed breaks. This is also the time of the southwest monsoon and many of the spots can see offshore conditions. The waves will normally range from 4-8 feet, with occasionally bigger days. February and March considered the early part of the season will see fun surf and more stable weather but swells will vary, arriving in the small to medium size range. The same holds true for November when the season is coming to a close. The North Male Atolls have been popular with surfers for quite some time thanks to a variety of spots that stay fairly consistent, especially in the prime summer months when south swells are in abundance. There is an assortment of spots scattered around these idyllicislands ranging from long points to hollow sucking barrels that can accommodate all levels of surfing. Although west to southwest winds are the norm at this time of year many of the breaks in this island reef chain are well protected and will remain clean, while others will be offshore. Crowding can sometimes be an issue because of the relatively easy access of the breaks courtesy of the many boats in this wave rich zone and due to the resorts that shuttle surfers out to the breaks. “Muli Outside/Mushrooms”: a fun long righthander that pulls in more swell. Gaafu Dhaalu Atoll Being among the first line of defense against incoming south swells, the Gaafu Dhaalu Atoll (also known as the Huvadhoo Atoll) is generally known to pick up more swell than it neighbors to the north and is more open to variations in swell direction. In a nut shell this means plenty of consistent wave action and some world class breaks. Due to the abundance of reef passes that are spread throughout this atoll there are a variety of spots for every level of surfing, be it more forgiving playful waves to grinding hollow shacks. The Gaafu Dhaalu Atoll is said to have the best conditions in March and April just before the southwest monsoon begins and September to November when it is coming to a close. From May to August there can be wind issues on the south facing spots but that’s when you motor to the east facing part of the atoll where there is more protection. The east facing breaks will still have plenty of size as this is the peak swell time. While you may encounter other charter boats in the area, most of the time you and your crew will have the spots all to yourselves. “Airports”: a fun righthander that likes a solid southwest swell. “Beacons”: on a good southwest swell this break becomes a grinding righthander with a solid barrel. “Blue Bowls”: this longish righthander is more like a point and has plenty of open face sections for good turns. “Five Islands”: a hard hitting righthander with speedy walls. “Two Ways”: a right and lefthander that tends to favor the right on bigger swells; an easy workable wall that sits well with intermediates. “Love Charms”: a fun lefthander which has a playful wall when the sections link up on a bigger swell. “Tiger Stripes”: a racy lefthander with a thumping barrel on the inside section; tends to hold more swell than some of the other spots. Addu Atoll Any surfer looking at the locale of Addu Atoll would be thinking one thing: surf, and lots of it. As the southernmost atoll, lying just below the equator, Addu Atoll has the best swell exposure in the Maldives. There is south, east and west facing parts of the atoll. Several expeditions have revealed a good lefthander off the island of Vilingili and a righthander just south of Gan, yet information remains somewhat limited. Unlike the northern atolls where island commuting is done by boat, the Addu Atoll has a road connecting the islands, which makes overland travel possible. “Airport Lights”: a very fast and heavy righthander with nice barrels breaking over a shallow reef. “Vilingili/Madihera”: a on-off lefthander that has the odd good day and can be really fun with a barrel here and there. There are several take off points but the wave can behave a bit strangely due to the unevenness of the reef. 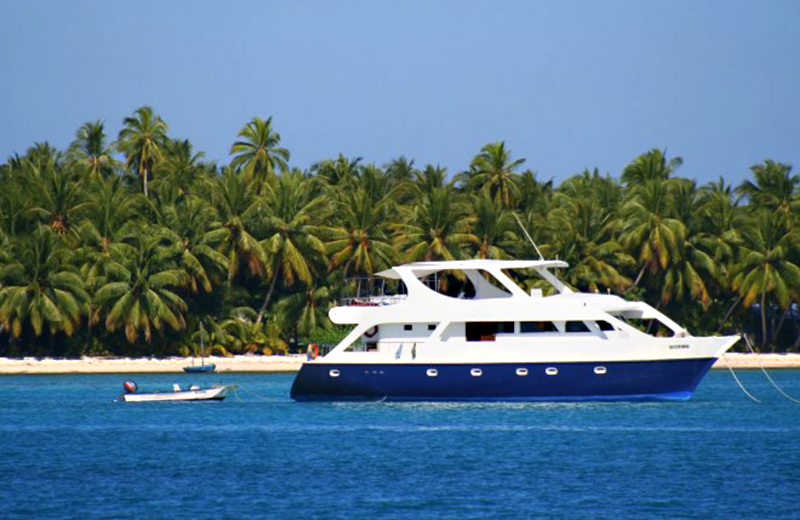 “Vilingili Right”: performs well with a small and cleans southwest swell. “Mulikede/Kanda Muli Left”: a peaky beach break style wave that is fun on small swells. “Hithado/Kottey Right”: a beach break style reef. “Gaukendi Bridge Left”: a go-to wave when it’s too small everywhere else. RATES: Individual rate up to 10 pax: 1,700 USD net pp. Departure confirmed regardless of a number of guests!! !